Nothing else than a TI-1250 with another keyplate sold under the name of True Value. Don't miss the T-1220 based on the TI-1200. Maybe there is a story behind this calculator ? One source (1) tells that this calculator was planned as a regular TI calculator. Shortly after approval of the calculator by the QRA the project was stopped. The box of the T-1225 states: Custom model manufactured for True Value Hardware Stores. The warranty address on the back of the calculator is: Texas Instruments Service Facility. 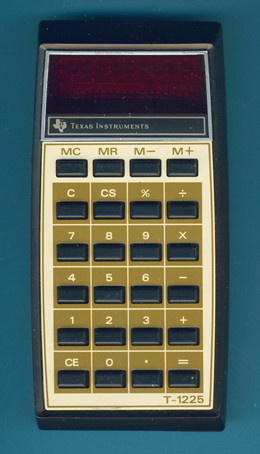 Don't miss the rare Texas Instruments 1265 manufactured for Koh-I-Noor Hardtmuth.